I described a way of predicting muscle fiber type distribution based on force-velocity (or power-velocity) data collected using an SRM. Because each individual's situation is different, I had not intended to go into detail regarding how to actually collect such data. My previous post generated more interest than I anticipated, however, so in this post I will attempt to at least provide some general guidelines. Nonetheless, I anticipate that anyone attempting to perform such testing themselves will likely have to go through a bit of trial-and-error to perfect their own approach. As described previously, the force-velocity relationship during cycling is essentially linear (such that the power-velocity relationship is parabolic in nature). This has been demonstrated in various studies, either via use of a specially-constructed isokinetic ergometer (1) or by simply having subjects perform multiple, maximal efforts against varying resistances on a standard friction-braked (Monark) ergometer (2). However, the simplest and hence most elegant approach of all is the inertial load method devised by Dr. Jim Martin (3). Dr. Martin's method utilizes a standard Monark ergometer that has been modified such that 1) the only source of resistance is the inertia of the flywheel and 2) the position of the flywheel can be measured with high temporal (i.e., 1 microsecond) resolution (cf. Fig. 1). Figure 1. Inertial load ergometer developed by Dr. Jim Martin. 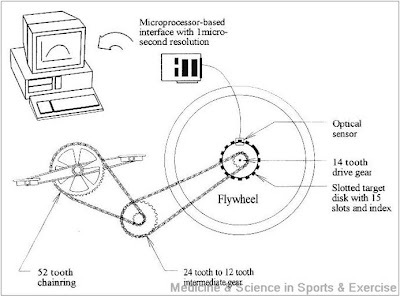 With this ergometer, near-instantaneous power can be measured every 3 deg of crank revolution based on the rate of acceleration of the flywheel. Alternatively, power can be averaged over a complete pedal revolution, thus reflecting the combined extension/flexion of both legs. In either case, judicious choice of the inertial load (which depends upon the moment of inertia of the flywheel and the gearing) enables the subject to reach their optimal pedaling rate in just 2 s, and to complete 6.5 revolutions in just 4 s. This makes it possible to determine an individual's force-velocity (or power-velocity) relationship during a single, brief test in which significant fatigue does not occur. Few readers of this blog are likely to have access to an ergometer like the one developed by Dr. Martin. However, it is possible to obtain similar data using an SRM by 1) recording data at a sufficiently high frequency, and 2) selecting an appropriate resistance. The "how" and "why" of this approach are described below. Figure 2. Effect of different sampling frequencies on data obtained during force-velocity testing. The other key aspect when performing force-velocity testing using an SRM is selection of an appropriate resistance. If the resistance is too low, then the individual will be able to accelerate the cranks too rapidly, and only a few point(s) far to the right/down the force-velocity relationship will be obtained, and/or force will fall off excessivly due to the difficulty in coordinating muscular actions at very high pedaling rates. On the other hand, if the resistance is too great, the subject will not be able to accelerate the cranks rapidly enough, and only a few data points at the upper left end of the line will be obtained before fatigue begins to occur. If the resistance is just right, however, data will be obtained across a broad span of velocities (and hence forces) before fatigue develops. These points are illustrated in Figure 3 below, which displays data from force-velocity tests performed with different inertial loads. With the high and medium inertial loads, I was not able to accelerate the cranks rapidly enough, and hence "fell off" my force-velocity line after 4 s (denoted by the arrows) at very low and moderate velocities, respectively. Conversely, with a lower inertial load, comparable to that of Dr. Martin's ergometer, data were obtained over a broader range of velocities before fatigue ensued. Figure 3. Effect of inertial load on data obtained during force-velocity testing. Note that the regression line was calculated by excluding all data collected after 4 s then pooling the results from all three tests. The SRM was set to record data at 2 Hz. The data shown above were obtained by mounting my bicycle in a Velodyne trainer and then varying the inertial load provided by the Velodyne's flywheel by simply using different gear ratios. While it would be possible to provide guidelines for appropriate inertial loads to for others to try, the wide variety of conditions under which such testing may be performed as well as uncertainty regarding the exact mass/moment of inertia of particular trainers, rollers, etc., means that this would be much less helpful than it might at first appear. As a general rule, however, individuals attempting such testing using the typical low-inertia magnetic or fluid trainer are likely to find that they need to use moderate-to-large gears to obtain good data. On the other hand, those attempting such testing outdoors will need to use very low gears - lower, in fact, than usually found on a road racing bicycle. In any case, the key point is that the cyclist must be able to accelerate the pedals rapidly, but not too rapidly, something that is readily determined via preliminary tests. In particular, the circumferential pedal velocity at which maximal power is produced (i.e., CPVopt)which is the basis for prediction of muscle fiber type distribution using the data of Hautier et al. (2), is highly reproducible. Figure 4. Effect of standing on the force-velocity relationship. As a consequence, the circumferential pedal velocity associated with maximal power output will generally be shifted to a lower value, which will lead to underestimation of the percentage of type II fibers than an individual possess when using the equation presented previously (which is based data collected while seated). This would therefore seemingly preclude use of data from, e.g., standing start efforts performed using typical gears as part of normal training or racing to predict an individual's muscle fiber type. Unfortunately, as indicated at the outset of this series of blog entries, at least in my hands powermeters other than the SRM do not appear to be able to provide data of sufficient quality to permit accurate (or at least easy) determination of an individual's force-velocity relationship while cycling. I will discuss these issues and provide some examples in the next entry. 1. McCartney N, Heigenhauser GJF, Jones NL. Power output and fatigue of human muscle in maximal cycling exercise. 1983; 55:218-224. 2. Hautier CA, Linossier MT, Belli A, Lacour JR, Arsac LM. Optimal velocity for maximal power production in non-isokinetic cycling is related to muscle fiber type composition. Eur J Appl Physiol 1996; 74:114-118. 3. Martin JC, Wagner BM, Coyle EF. Inertial-load method determines maximal cycling power in a single exercise bout. Med Sci Sports Exerc 1997; 29:1505-1512. 110%, eh? Well, a prediction is only a prediction...but I have to wonder whether you're able to accelerate the pedals fast enough. You need to be able to reach your optimal cadence w/in a handful of seconds, or else you'll "fall off the line" due to fatigue. Dear Dr. Andrew, recently bought ur book 2nd edition & was delighted to read through the chapters (though still on chp 6); it instantenously made sense of of all the different training levels(from Recovery to Neuromuscular Power) U have made it so simple & easier to understand.I have been reading about these from different books /blogs over yrs bt was always confused on how much time to spend on each and when to incorp what & write a training plan with clarity of backgroud knowelege. Thank you for efforts in presenting knowledge in this manner; now i know what to actually do with the power meter. I live in Pakistan and over here there is absouletly no concept / assistance for scietific training so i am on my own figuring out from different books & online literature. Q- While training indoors on the Trainer (Cycleops Fluid 2) & doing VO2Max drills of 3~4Mins should the POWER readings vary if all other variables are KEPT constant (i.e. Gear and candence)? My results vary btw 180Watts to 240Watts which is significant margin. 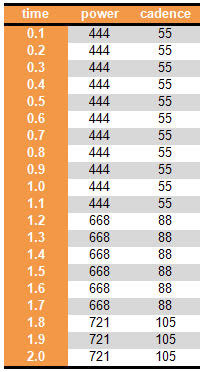 Is this generic and i should only focus on the uploaded data from the workouts or is there something wrong with my power meter???? Thanks in advance and do keep on sharing knowledge online. I was only half kidding, but I will try it again tomorrow seated. The other thing I was thinking is if the muscles can process 2-3times the amount of oxygen that we are limited to giving them, then wouldn't it be more beneficial for a cyclist to have a small amount of type I, and a large amount of type II. lets say you have 2 units of type I and 1 unit of type II compared to 1 unit of type I and 2 units of type II, both the 1 and 2 units of type one should be able to produce the same amount of power since we are only limited by the amount of oxygen we can deliver and not muscle mass. Then the guy with the 2 units of type II would have more 'reserve' to attack and be stronger during shorter efforts. Since this doesn't seem to be the case I am wondering what I am missing in my equation. I guess the answer to my question is that above ~50% VO2max we recruit both type I and type II so the greater amount of type II you have for a given power you will recruit more 'inefficient' type II fibers. Here are my results from yesterday (52% I) and today (64% I). The interesting thing is today's was after a few steep climbs and my results showed more type I. I wonder if this is a quick/easy method to determine aerobic & anaerobic fatigue based on max power and subsequent %fiber recruitment. My final question is, is this measuring % fiber type, or % surface area. If I do a bunch of anaerobic intervals, won't my optimal velocity increase quite a bit, even though my fiber type won't have changed significantly? Rayomond: Thanks for the complimentary comments re. our book. As for your question about the Polar, it sounds to me as if the device is at least periodically "locking onto" some resonant frequency than that of the chain. This is a known issue with the Polar device, at least/especially when used indoors. I have not used one myself to have any really good suggestions, but some people report that they are able to get good (i.e., reproducible) power readings indoors by 1) carefully positioning the receiver on the chainstay, and/or 2) taking steps to eliminate other sources of vibration (e.g., placing the trainer on some sort of rubber mat). If you hunt around the internet a bit I'm sure you will be able to find more detailed information. Fatigue would be expected to result in a slowing of the maximal velocity of muscle shortening, so the fact that your predicted % type I area* was greater the day after riding up some steep ascents may not be all that surprising. Looking at the pic you provided, though, I wonder if part of the issue simply isn't variablity in the data - that is, when using an SRM set to record at a high frequency, the power-velocity (or force-velocity) relationship should be a lot tighter than what you obtained. Maybe you're not using an SRM, though? *The original study correlated optimal cadence with % fiber type area, so technically the results should be viewed as such. As it turns out, though, there generally isn't enough difference between human type I and type II fibers in terms of their cross-sectional area for this to have much of an impact on things. For example, in my hands at least the gastrocnemius muscle is, on average, ~50% type I and ~50% type II, with the latter fibers being ~20% larger than the former (in young individuals, anyway). Even taking this difference in fiber size into account, though, the % type I area is still 50/(50*1 + 50*1.2) x 100% = 45.4%. Of course, training can impact the contractile properties of whole muscle (and limbs) via mechanisms other than changes in fiber size, such that the velocity at which maximal power is produced can change slightly over time. In this regard, the *predicted* type I fiber area percentage can be viewed as a way of "pinning a single number on things", even if biopsy-determined fiber type hasn't *necessarily* changed. Can this information be used for any other purpose? For example, can the 'optimal' cadence help determine a target cadence for time trials? I can think of a number of situations in which the enhanced self-knowledge gained via such testing could potentially be useful. As you suggest, selection of gear/cadence during TTs would be one of them. Indeed, this was exactly the case when my wife raced the 2007 Missouri state TT on her pursuit bike. As an inveterate trackie, the notion of using a gear bigger than something in the low 90" range was abhorent to her. Based on the results of F-V testing, though, I knew that she was clearly skewed toward the slow-twitch end of the spectrum. Based on her functional threshold power, CdA, etc., I also knew that she could go well under the hour. I then calculated that to keep her cadence close to her optimum (for submaximal power production), she would have to use a huge gear, at least by trackie standards. She was skeptical, of course, but agreed to use a 50x13, or 104" (I'd actually pushed for something even bigger, but we compromised). She went on to smash the course record with a 56:52, >8 min faster than the 2nd-place woman and faster than all but six men. However, more important (to me, anyway) was the fact that she said she never really felt the urge to shift up or down during race, except during the last couple of kilometers where the sight of the finish line and a slight tailwind had her wishing for an even bigger gear. Without the understanding achieved (in part) via the F-V testing, though, she would have used a much smaller gear, and would have likely produced less power and gone slower as a result. How does that fit with the ideology that if you increase your cadence, you increase recruitment of ST fibers because you are reducing the force requirements? With that thinking she would want to use a high cadence to utilize her predominantly ST fibers. Should we focus more on our 'optimal' cadence instead? The *theory* is that by increasing your cadence, you reduce recruitment of fast-twitch motor units (not increase recruitment of slow-twitch motor units). This theory, however, ignores the fact that both the force *and* the velocity of the (intended) muscle contraction play a role in determining the level of central motor drive at which a given motor unit is recruited. Thus, in point-of-fact what the research actually shows is that the cadence at which you pedal has little influence on the overall pattern of motor unit use. To the extent that it does, however, those with a lot of slow-twitch fibers would want to pedal more slowly, not more rapidly, as this would mean that these primarily-recruited motor units are working closer to their optimal speed of contraction. Again, this is in fact what has been found in at least one study, i.e., self-selected cadence was lower in those with a higher percentage of slow-twitch muscle fibers. I was going to comment on the latest post but you seem to have disabled that feature :) Anyways, I just wanted to mention that I was using a Quarq with 1s recording via Joule for my data collection. I have also not noticed the spikes that you mentioned in the blog post above this. And to give a little more credibility to the 1s recording I have been averaging ~60% TypeI and 40% TypeII using this method. I recently got a track bike and was experimenting with what the maximum cadence I could achieve when I remembered that max = 2x optimal. Using this method and adjusting for crank length I also got 60% I and 40% II (238RPM w/ 165's I think). Anyways I thought it was interesting/exciting that both methods gave me the same result so I thought I would share. I went through the numbers reported in figure 4, and it seems to be the other way around: 18% advantage for seating over standing. I obtain seated: 713 W at CPV 2.05 m/s and AEPF 346 N.
Standing: 586 W at CPV 1.36 m/s and AEPF 431 N.
This can also be easily seen graphically because the mid point for the X intercept for the standing line is found below the seated line. I'm sure Dr. Coggan can reconcile this better with the other points he made in the blog. I will only venture that the main reason why people stand is not for power but for added force (which is shown by the part of the standing line above the seating line). From an endurance point it may seem counterintuitive, but there could be a benefit in standing too: if I'm standing and pedaling at the most efficient speed for standing, which is lower than seating, I'm using less power than if I were seated and pedaling at the most efficient pedaling speed for seating. In turn I will be taxed at a lower metabolic rate. I think that ergometer is the best way to fitness your body and muscles. It might not be the bad idea and I really wish that an ergometer is in your fitness tracker.